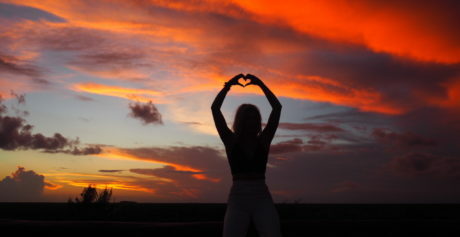 Before I knew it I had spent eight days in the magical town of Tulum. I was comfortable. I had only been in Tulum for eight days, but as I was leaving I wondered if I was making a terrible mistake and if I should stay for longer. In such a short amount of time I had made some great friends, had a Mayan reading, familiarised myself with the area, and obtained my PADI certificate. It’s amazing how quickly you get comfortable somewhere, and I wondered if I would ever get used to picking up and starting again each time I made my way through Mexico. It’s funny because when I originally arrived in Tulum, I didn’t see what all the fuss was about. When I first made my way along the tree-lined coastal road, I was excited to see the girlfriends I had made on Holbox Island again, and excited to experience a town I had heard so much about. Tulum is about an hour and a half south of Cancun, and is split into two parts: the beach strip, which is a road of eco-hotels and cabanas, restaurants, and boutique shops that runs for 10km along the sea; and the town, which is based along a main road and is where most of the hostels are located. A lot of Brits and American friends had told me that Tulum was one of their favourite places in the world, so I had high expectations of a beautiful and spiritual destination. We must be nearly there, I thought as we continued along the long road when suddenly we turned left and I was told we’d arrived. Oh, I thought, where was the cute market square and village vibe of Holbox Island? We’d literally just turned off the road straight to my hotel. My disappointment quickly disappeared when I walked into Ahau hotel and saw the girls. The hotel is right on the beach and is made up of the beautiful buildings with palm tree roofs that I love so much. I shared a massive honeymoon-worthy room with Erica that faced right out onto the ocean and had a terrace and big bathroom with a good shower (always very important to me). We wasted no time in discovering that Ahau serves the best margaritas and chicken tacos, which we enjoyed right by the sea. The hotel is really well located amongst the main restaurants and bars of the beach road, and is right opposite Casa Jaguar and Gitano, which are two of the liveliest bars I went to. Throughout my time in Tulum, I also stayed Villa Pescadores and Alaya, both places I would recommend. Villa Pescadores is on the very left side of the coastal road, which is the much quieter end and only a short walk away from the ruins. 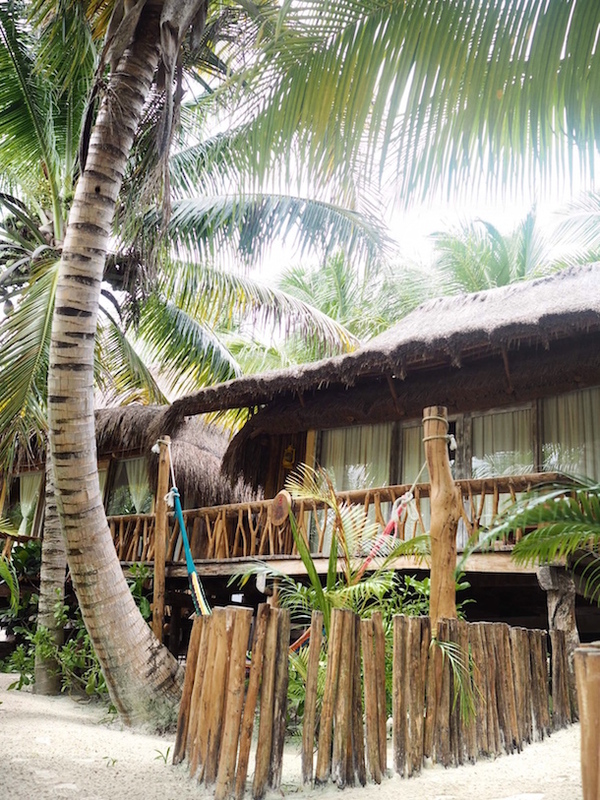 The rooms run down a palm-tree lined path to the beach and have hammocks, and each room had its own private terrace where I spent many mornings drinking coffee and listening to the sea. Pescadores means fishermen in Spanish, and it’s called that because the it’s where the fisherman still keep their boats. Alaya is nearer to Ahau and I think it was my favourite of the three places I stayed as it felt incredibly private despite being right in the mix, and I had a huge apartment with exposed brick walls. Between writing, doing my PADI and enjoying some amazing group dinners at Ahau, Posada Marghertia, and Cenzontle, time just kind of just disappeared in Tulum, and before I knew it I had been there for a week and I realised it was time to move on. I had met an amazing group of Mexicans who lived in Tulum, but it meant that I was being well looked after and so I wasn’t living the life of a traveller that I craved. Plus Tulum is expensive. It was on my final day after getting my nails done in the town that I stumbled upon the coolest bar called Batay’s. 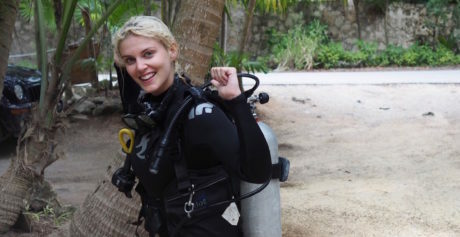 I first heard about it whilst diving at Casa Cenote when a group of Americans invited me to join them for a night out there. I didn’t end up going in the end because to be honest I’m not much of a night time person, and one of the most liberating things I’d discovered so far about solo travelling was that I wasn’t obliged to do anything I didn’t want to. I can be the life and soul of the party but much like Cinderella, at midnight I lose my spark. So I didn’t go, but after walking past it with a fresh pair of acrylics (some luxuries I just can’t live without), I decided to pop in and see what the fuss was about. 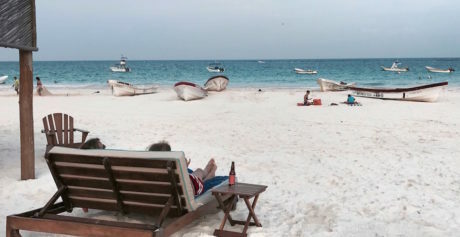 What I didn’t realise was that in doing so, I’d have two of the best hours I’d have in Tulum. “I’m not a massive fan of mojitos”, I said when the Americans at the Cenote originally told me that Batay’s did the best mojitos. “You haven’t tried those ones then” they replied casually. And they were right. I took my first sip of my passion fruit mojito with much cynicism, but it was incredible. As I sipped away at my drink, I noticed someone crushing what looked like bamboo through a machine attached to a VW Beetle. As I took my fourth sip, a man with a thick Italian accent came to talk to me as if I was an old friend, and he explained that the bamboo was actually sugar cane. The same sugar cane they used to make the mojitos. No wonder it was good. The Italian turned out to be called Gabriele, or LeLe as he was known, and he was the charismatic manager of Batay’s. He told me that he deliberately wrote down the wrong wifi codes on the wall so people would have to talk to each other to find it out. It was a simple idea, but it worked, and I chatted to a variety of people as I enjoyed a couple of ginger mojitos. As my taxi left Tulum along the beach road, I was slightly tipsy and noticed so much more than just the tree-lined road I had observed on arriving. I saw signs for multi vibrational sound healing, for Mayan massages, boutique shops selling cute beach attire and wind chimes, vegan juice bars, people moving around on bicycles, and the most beautiful motivational road signs (an art project by Olivia Steel). 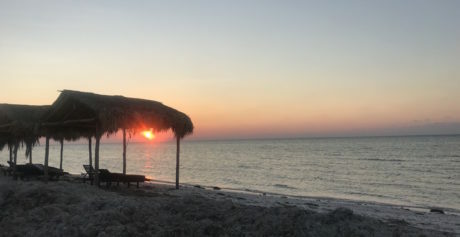 How had I missed all of this when I first arrived along the road from Holbox Island? Tulum was such a magical place and it was with such a heavy heart that I was leaving… only it wouldn’t be the last time I’d visit it on this trip, but of course I didn’t know that yet! If your jet setting soon, make sure you check out some of these travel essentials and styles below.